All transactions are safe and secure with a reliable history in online purchasing behind each of our associates. Buy the Cars Red the Fire Engine t-shirt to own Cars clothing and merchandise. Based on a mid-1960s closed-cab pumper fire truck, Red the Fire Engine handles emergencies that arise in Carburetor County. This t-shirt displays him watering a flower, which is a nod to his passion for gardening. He also spends time shining the statue of Stanley that is outside his fire station. Other than huffs and crying, Red never speaks, a characteristic that can be attributed to his shyness. 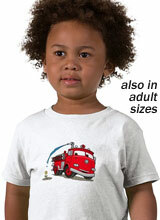 Pair this Red the Fire Truck tee with other Disney Cars Movie t-shirts for a great gift idea. Your child can even wear this clothing item to water his or her own garden. In addition to the Cars Red the Fire Engine tee above, browse the Cars Clothing Gallery for more apparel like men's and women's clothes, kids shirts or hoodies.